Bob Pease was an expert analogue designer who developed seminal circuits that are still with us today. 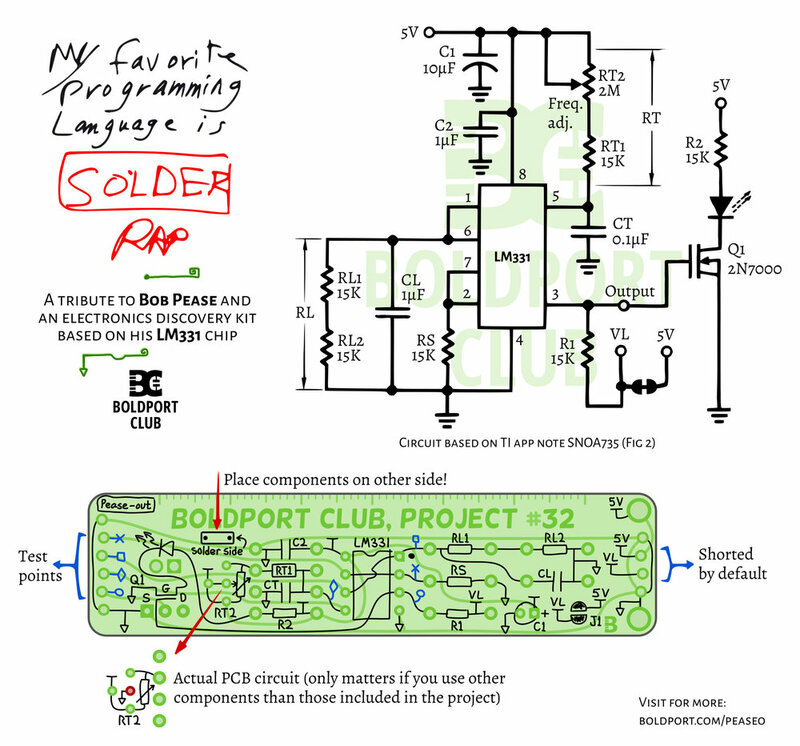 Our first tribute to Pease was our first ever Boldport Club project, and this current one is the last ‘monthly’ project. This version uses a circuit around the LM331, also designed by Pease. It is a sinle voltage to frequency converter where the setting of the trimmer sets the output frequency that can be observed by the flashing LED. The frequency range using the multi-turn 2MΩ trimmer is about 3Hz to 300Hz. The circuit itself appears in Application Report SNOA735B, Figure 2. One of the primary advantages of this arrangement is that the output isn’t affected (much) with the supply voltage. The Application Report details other advantages. Pease-out was Project #32 of the Boldport Club. Place components on the right side! See the symbols on the PCB. There’s an extra hole that we added to allow people to use other potentiometers. Unfortunately we wired it wrongly (it’s connected to ground). If you’re going to use the components we provided, then everything’s fine. If not, pay attention not to use this hole and potentially creating a power short.